The courses on these pages are recommended for those who wish to gain personal hillwalking skills as well as the skills required to lead others in the hills and mountains of the UK and Ireland. They range from the Lowland Leader Award (training and assessment), which is relevant for those working within specific terrain and weather limitations, the Hill & Mountain Skills Scheme which is a practical introduction to the techniques required for hill walking, through to the Mountaineering Instructor Award, which is the highest award available in Ireland and UK for the instruction of rock climbing, hillwalking and mountaineering skills. Our courses also include the Climbing Wall Award (including an Abseil Module) and the Climbing Wall Leading Award. 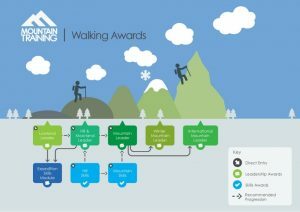 Following a UK & Ireland wide review of the Climbing Awards, 2018 will see the introduction of a number of new skills and leadership awards and amendments to existing schemes. The list of awards listed also include the new titles for many of the awards as well as the existing titles.